PREFER TO SEE BEFORE YOU PLACE YOUR ORDER? THIS MUCH SOUGHT AFTER BOOK OUT OF PRINT FOR ELEVEN YEARS, IS NOW BACK IN PRINT! I have loved your work for a very long time. Thank you for making the world more beautiful. HAVE YOU EVER BEEN BREATHLESS WHEN VIEWING AN EXCEPTIONAL LACE MADE BY SOMEONE LIKE CATHERINE BARLEY? I OWE YOU A GREAT DEAL IN MY LEARNNG OF LACE. YOUR BOOKS HAVE BEEN VERY PRECIOUS ........ AND THEY ARE RARE. CONGRATULATIONS AND THANK YOU. Thank you for all you have done to promote Needlelace and teach it. Your book is always my first stop if I have a query with anything - and the answer is always there!!!!! The Henley Bridge photos on your website were so helpful when I was doing the Gold Panner - you are such a great teacher - even from afar!! I am sure you are working another wonderful piece. That ice skater is superb. I found your book searching 'how to Needlelace'. Your book looks fabulous that I have to have it. I would really try to come to England and beg you to teach me your awesome stumpwork figures. I am sorry I don't see awesome stumpwork figurines and I want the skill for my casket. One of the best books out there. I love that it gives you projects as well as the techniques and historical information. For the beginner, this is really useful - I'm going to enjoy working my way through each project! I would like to order your book. I am challenged with needlelace and need a book that will keep me focused. You come highly recommended by Jenny Adin-Christie so I do hope you will be able to supply the book. Many thanks for sending me a re-print copy of your beautiful book. I am the proud owner of an original 1993 copy - it has been in my personal library for many, many years plus we also have a work copy here in our office. It is a superb book and your work is simply glorious and incredibly inspiring so it is wonderful that you have taken the decision to reprint. Hi Catherine, your book arrived safe and sound yesterday and I love it! I have a few books on needlelace and I think this book has the clearest explanation on how to do things. Thank you! Catherie your book was highly recommended to me by Loretta Holtzberger in our guild, Lacemakers of Puget Sound. I can't wait to tell member bout the new edition. I have never seen any work to match the stunning quality of yours and had to write and say so. My own stumpwork and needlelace attempts fall far short of your expertise but seeing what you have achieved has only inspired me to keep at it and try to improve. Thank you for sharing your work. You won't be unhappy with the book - it's fantastic! I think it's my favorite needlework book. I dream of the strawberries on the cover. I love Catherine Barley's work! So Inspiring! I can understand that you are left with open mouth! I would be willing to bet that the net ground is needlelace. Catherine would not use purchased ground for that, - It would be needle made. So even and beautifully worked, but all by her own hand. Amazing! This is just Beautiful. Congratulations. Oh! how I wish my lace could look so even. that ground is wonderful. You certainly give us something to strive towards, - but you do set the bar a bit high Catherine!!! I have received my copy of Needlelace Designs & Techniques. It is an absolute joy and I am beginning to appreciate why it is considered the standard text on the subject. Many thanks for the book - it has arrived safely and is absolutely stunning! There are so many lovely projects to make - I am going to start with the pea pods which will keep me busy for a while. It is a lovely book, as everyone has said. You make it sound so simple, clear and easy. I have received your book and would like to thank you so much . I am lucky to have your book and wonder if you have in mind of writing more books on lace? I was really happy to receive your book so quickly! Thank you for the lovely post card too! it many hours of creativity and joy! I am viewing the book in awe and hoping one day to attempt some of the wonderful designs. Thank you again. I wanted to pursue the Gros Point de Venise but could never figure it out (thanks to you now I understand). It was the Gros Point that first attracted me to your book. I never would have imagined my interest would shift from Gros Point to Point de Gaze. Your book is magnificent, and I hope I will be worthy of it. provide me with hours and hours of great pleasure. I have got my book from the post office and just wanted to say how delighted and inspired I am and to thank you for your prompt response. Your photos of works in progress are So helpful. You are a wonderful teacher, and I learn so much every time I look at either your book, or your web site. How I wish I had learned needlelace many years ago. I received your needlelace book yesterday. It is a lovely book - thank you for helping to keep this craft alive. I am in heaven. With the book and Roy's painting to admire. One question. How do you make your faces so lifelike? They really are the best. Love the Stumpwork onto the painted background, what a wonderful combination. I received the book Christmas Eve. I was so happy toGet it. It is even more than I had hoped it would be.Your work is amazing and I can only hope to be so great.Thank you so very much!!! By all reviews I have read it is the "go to" resource. I took the time to look at some of the photos of your work and it is stunning. Your work is a "dream" and gives great enjoyment and inspiration to others, thank you. The book has just arrived – I have had a quick flick through and the designs are even more spectacular and the finished lace is exquisite. magnificent work. I will try to make the strawberry tassel shown in the latest Inspirations Magazine. I loved the poem in the front by Noelene Lafferty, according to my husband it should read "I must live past two hundred and nine"
Thank you again for writing and publishing this lovely book. Please may I order a copy of your book "Needlelace: Designs & Techniques, Classic & Contemporary"? I've read about it in Classic Inspirations magazine and I cannot wait to get my hands on a copy. I renew my congratulations for your work, true masterpieces of art and patience. Thank you so much for your beautiful book that arrived yesterday. It is stunning! The book arrived safely, and I spent last evening browsing through it. A lovely inspirational book, and my congratulations to both yoursefl and your husband for the beauttiful pieces you have crafted. I really appreciate the effort you put into not only creating these works of art, but also in writing the book to share your expertise with us all. You really are an inspiration and I am very grateful to be able to have the book. It will spur me on to better things. I am really pleased with it and cannot wait to start using it. Your beautiful book is delivered this morning. Thank you the books arrived just prior to my daughter and I leaving for Hampton Court,I am visiting thr Royal School of Needlework. The journey down was agonizing as I could not wait to look at your book. Since arriving I have been so absorbed by your book that I lost all sense of time. Just cannot wait to pick up a needle and start a project. I will report to you, when I will get a book. Your works that I saw on your website are magnificent! I am delighted! I am just so thankful you had more, I fell in love with the book at once. Now, the book will never leave my house, I will just take an iphone picture of the page that I am working on, terrified to let it out of my sight! I have just spent an hour browsing you blog your work is so beautiful and awe inspiring. thankyou for sharing. The book we have all been awaiting for the last few decades, whether we are beginners or experienced in the art of needle lace, has been reproduced, this time in a spiral-bound form which will lie flat for ease of use. Those of us who were lucky enough to buy one originally, printed by Batsford, have closely guarded their copies, and since then they have been nearly impossible to obtain with the prices on Internet sites having rocketed out of all proportion. It is a very comprehensive book, guiding the beginner through various progressive stages of needle lace, with both written instructions and diagrams. It includes white and coloured lace and even warns the reader of possible problems ahead and how to avoid them. There are instructions on the use of wire for three dimensional work and the inclusion of beads and accessories together with photographs of beautiful antique laces including Point de Gaze and Venetian Gros Point with details of how to make both latter types of needle lace in modern times. 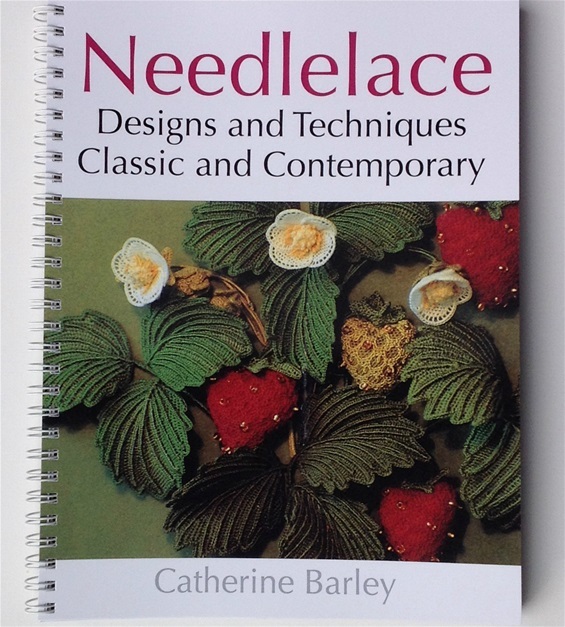 For those who are proficient at needlelace, it is still an essential book to have on the shelf, not only for checking methods of work but also for those moments when inspiration is needed! Catherine is very generous in sharing her abundant knowledge with the reader, her style and attention to detail is legendary and I am sure that yet another print run will be needed before very long with many more lacemakers enjoying the introduction to needle lace. This book, as soon as it was initially published, immediately became (and still remains) one of the leading books in its field. PREFER TO VIEW CONTENTS BEFORE PLACING YOUR ODER? THEN READ MARY CORBET'S REVIEW OF THIS MUCH SOUGHT AFTER BOOK WHICH IS NOW BACK IN PRINT ! JUST CLICK ON THE LINK BELOW OR COPY AND PASTE INTO YOUR BROWSER. TEMPTED? THEN EMAIL ME AT catherinebarley@btinternet.com with ORDER as your Subject title. The book price is £26.50p plus P&P. Please include your name and full postal address including Zip/Post code and country of residence for cost of P&P. I can acccept PayPal or UK cheque.